For a sweeter alternative, why not add some white chocolate. Soak the sultanas in hot water and Irish Whiskey for approximately 30 minutes. Butter all the slices of bread and cut off the crusts. Layer the bread up in 4 small oven proof dishes or ramekins or one large dish (12 x 8) and scatter the soaked and drained sultanas in with the remaining 2oz of caster sugar in between each layer of bread. You should end up with three (or four) layers of bread altogether. Break the eggs into a large mixing bowl and add 5oz/150g caster sugar and cinnamon and beat together until combined. Pour the milk and cream into a large saucepan and bring to the boil. Pour the boiled milk over the egg mixture and whisk well until combined. Slowly pour all of this mixture over the bread and butter and allow it to stand for about 10 minutes. Put into the oven and bake for 40 minutes until the mixture is well set. Melt the butter in a large saucepan and add in the brown sugar. Allow this mixture to come to the boil. Be very careful at this stage as the butter and sugar mixture is very hot and could burn should it contact your skin. Pour in the cream and whisk continuously. Allow the mixture to come to a boil and then reduce to a gentle simmer for 8-10 minutes. 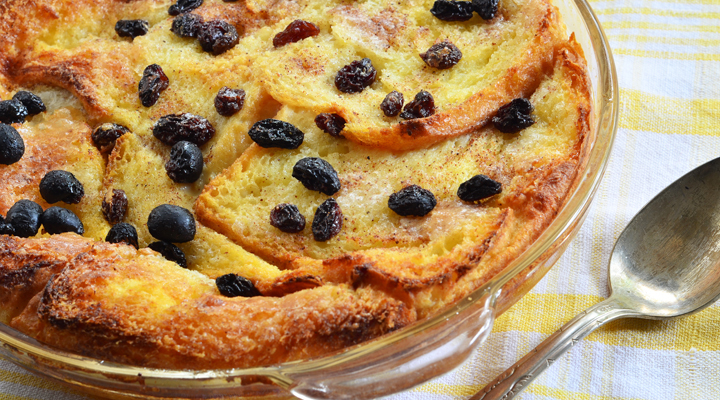 Serve with the traditional bread and butter pudding. Wonderful receipes must try the bread and butter one .It was a favourite when I was growing up. LOVED IT THANK YOU.